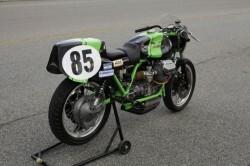 For all the interest I have in getting my body out onto a racetrack to hone my skills on a modern 600cc sportbike, those bikes all seem like such… appliances. I’ve ridden a few and I know they’re fast and I know they’re reliable. But, once you get past the nearly insane levels of performance available, they seem sort of bland. Soulless. I think that’s the major attraction for me: I wouldn’t care about thrashing one half to death. That’s when I start to think, “Hey, you know what would be a cool machine to race? A vintage BMW sidecar rig!” But I can never seem to find anyone crazy enough to ride as my passenger. 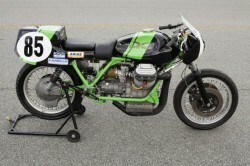 So maybe this would work better for me: a vintage racing Moto Guzzi. RACE PREPPED 5 SPEED TRANS. I believe the opening on the left side of the engine case on under the carburetor marks the missing starter. The owner states that he was looking to convert this bike back to street use and it looks to be in gorgeous shape, but I’m not sure how much would need to be sourced or modified to make it streetable. Certainly, the adjustable swan-neck clip ons would be nice for street riding. I think I’d just leave it as is and hit the track. 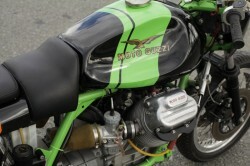 BEAUTIFUL 1973 MOTO GUZZI 750 AHMRA racer. 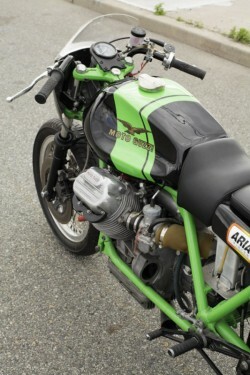 i bought this bike 2 years ago with hopes of making it into a street/racer. i have 3 unfinished bikes ahead of it. i need the space, and unfortunately this one is the last in line, so the one to go. 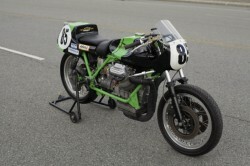 i bought the bike from a collector in the south, it was raced, and then retired, emptied of all engine fluids and stored. that is the state it is in now, i have never started the bike. the bike comes with a separate starter on cables to a battery on a small hand truck. it also comes with stand pictured. the bike has an ALABAMA title. and paperwork for mechanical work, and parts. extremely clean, and cosmetically beautiful. only the rear vinyl number plates are starting to peel on the edges. 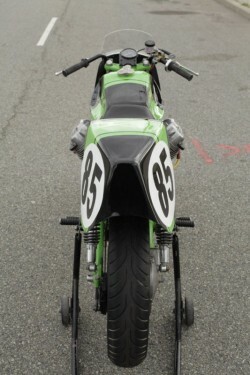 I’d actually seen this bike on www.bikeexif.com a while back, and it looks like these are the exact same photos. The seller mentions that the Buy It Now price is $9,500.00. Considering what a good Guzzi of this era might go for, and the parts and prep that have gone into the bike, it honestly seems like a good deal. Lots of time left for you to sell off a whole bunch of old CD’s and DVD’s to finance your purchase. Previous story Seeing Double: a pair of Kenny Roberts Yamaha RZ350s!